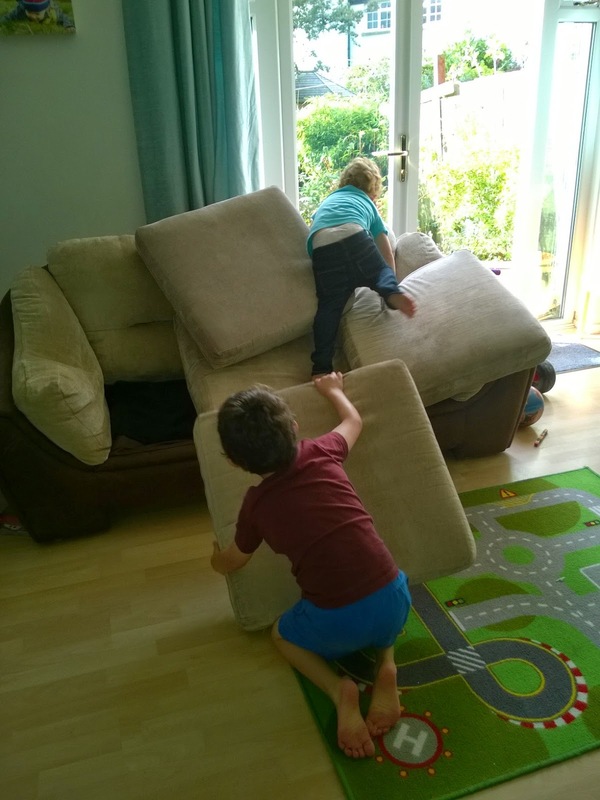 Lots of savvy parents have already realised that the 'toys' that kids play with the most are cardboard boxes, household junk, everyday items and 'things they shouldn't be playing with' such as reconstructing the sofa as a mountain and slide. With the exception of a few bought toys that have endless facination such as wooden train tracks, building blocks and musical instruments, lots of toys end up barely touched. Part of the reason for this may be sheer overwhelm - if you are faced with hundreds of 'things', each individual item loses value to you. The time it really becomes apparent that a toy cull is needed is when, having got the kids to put everything in the toy box so you can vacuum, all their good work is undone by the 'toyvalanche' as the overloaded box spills out back all over the floor. Some of this is solved by regular sort outs - a box for tracks, a box for cars, a box for bricks, a box for animals and so on, all stored on a bookcase so you can cycle the toys around and not have everything jumbled together all at once. Even so, with birthdays and Christmas looming there comes a time when enough is enough and it's necessary to pass on, donate or even sell off some of the hoard. How you go about it will depend on the age of your kids and how attached they are to the things. I tried to cull the toys in the summer, but kept the bag in a wardrobe in case they were missed. It turned out that at that point the boys weren't ready to part with their old toys. So we have tried again - this time I asked the boys to pick out anything they thought was a 'baby toy' that they were too 'big boy' for, watching their cues to see if they had any particular reluctance over a certain toy - no soft toys made it into the give away bag. We decided together on the places we would give the toys to - Ollie decided the gymnastics waiting room and creche were a good plan as other kids could share the toys but they would still be able to play with them sometimes. When the time came, Toby retrieved one toy, but the rest of the toys and books were happily left behind. Phew! There's also an interesting link between toy overwhelm and behaviour - I read about a family that vastly reduced their son's diagnosed ADHD by working at home and with his teachers to declutter the areas he was in, repainting in calm colours, ditching most of the toys, and also addressing his diet and activities. They managed to turn things around so much that he avoided being put on Ritalin. Separate toys into boxes with themes, e.g. building bricks and stack onto a bookcase. Keep puzzles and toys like games with lots of little bits in a cupboard or on a high shelf and put back when finished with for the day. Many families find a 'one in, one out' rule works to keep on top of toy clutter. Give children options for where their old toys will go - the more they understand the toy's new home the happier they will be 'for Fred's new baby sister to love' will go down better than an unknown destination where they may worry their toy won't be cared for. Only pass on toys you'd be happy to receive - give everything a clean and a check over before it goes. Best of luck - we've made a good start but there's certainly more to be done in our house!